Ben is a Senior Engineer on the Integrated Benefits Initiative team. He joined Code for America as a fellow in 2015, working as a designer on safety net healthcare services in Richmond, VA. After the fellowship, he joined the team as a staff engineer, working on Clear My Record for two years, before joining the Integrated Benefits team. 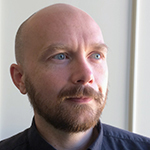 Ben previously worked as a Research Assistant in MIT's Department of Urban Studies and Planning, and taught digital design skills at UC Berkeley, California College of the Arts, and Architectural Association Visiting Schools. Ben is interested in inclusive design and how technology can enable more just policy outcomes. When he's not working, Ben likes to volunteer, cook, and make art with an old pen plotter.